All of us want to have a fast loading website. Nobody is patient enough to wait long enough for a site to load fully. If your site loads up slow, then you are surely going to leave a very bad experience on your visitors. Various studies claim that, if your site doesn’t load up in 4 seconds then your visitors will tend to navigate away from your site to other ones (probably to your competitors). Speed is also a very important factor in terms of SEO after Google officially confirming that they include “Page Speed” as a ranking factor. There also comes the significance of conversion and leads with respect to website loading speed. Studies say that, your site will tend to convert more if it loads up faster than your competitors. So, your website speed is much more important than you had ever thought of. It not only improves user-experience, but also helps in SEO and leads. So in this article, I am going to talk about some of the best and most efficient plugins to speed up your WordPress site. I will deliberately, not include too many WordPress plugins to confuse you. The idea is not about installing too may plugins, it’s about including only the right ones which are necessary for your site. Rather too many plugins can actually slow down your website drastically and can also result in conflicts. But I will try to include as many alternatives as possible for you to try out different plugins and find the one which suits you the best. Caching is one of the most important steps you need to take to speed up your Wordpres site. As WordPress is a dynamic platform, so it generates dynamic PHP files rather than static HTML files, thereby making several database calls to retrieve data every time a visitor opens your website. This is a slow and heavy process which invites the concept of caching (or storing) the dynamic content in static HTML files thereby improving the performance of your site drastically. There are several caching plugins available in WordPress, but the best one (according to my experience) is W3 Total Cache. This plugin, with around 2.5 million downloads, offers you with efficient caching performance and deep control. Developers of this plugin claim to speed up your Wordpres site by “at least 10 times and to save about 80% of your bandwidth with their efficient compression and minification technologies”. “A picture speaks more than a thousand words” is true, but too many images and images with very high resolution, size and color information, can drastically slow down the loading speed of your entire website. This plugin with over half million downloads, solves this problem to some extent by using Yahoo’s excellent lossless image compression service Smush.it and reducing the file size of all your images considerably. It’s obvious that with reduced image file size, your site will load up much faster than before. Just install this plugin and activate it, and you are all done. It will automatically compress each and every image you upload. CloudFlare is not essentially a plugin, but rather it’s a service. But this article would be completely incomplete if I do not include this awesome service to speed up your Worpress site. There is a plugin available for CloudFlare in the WordPress Plugin Directory for free, otherwise including this service would be completely out of the scope of this article. CloudFlare is a Content Delivery Network, which aims to speed up any website by serving the website data to the visitors from the nearest possible data center. It distributes your website content on various data centers scattered uniformly throughout the world. If you have a website getting visitors all over the world, then CDN is something which can drastically improve your website loading speed. Moreover, CloudFlare offers free of cost service too and there are plenty of other efficient tools available in the Dashboard to speed up your site. Integrating WordPress with your CloudFlare account is very simple and can be done within a few minutes. You can also install the CloudFlare WordPress plugin to facilitate the integration process. First you have to understand a bit about the concept of lazy loading before starting to use it. 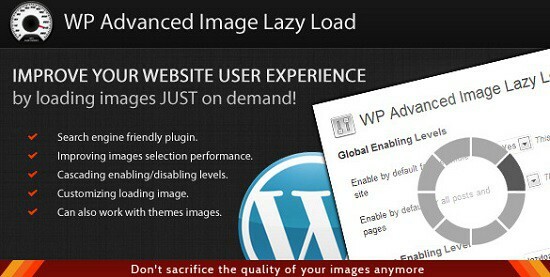 Lazy loading is essentially a technique to delay the loading of images which are not in the active view port of the browser. As the visitors scrolls down, more and more images starts to load up as they appear in the view port of the browser. The concept is simple but can prove to be extremely effective in terms of improving your site load speed. I will cite an example to make your realize the fact even better. Suppose you have a blog post showcasing “100 WordPress Themes” to your visitors. It’s not always necessary that every user will see all of the themes. The user may scroll down to 20 themes and find the one he is interested in and doesn’t go for the other 80’s. So, is it necessary to load all the images and waste the valuable bandwidth? Here comes the idea of lazy loading, which will delay the loading of those 80 images. If the visitor decides to scrolls down, more images would be loaded and shown, otherwise not. Moreover, loading 100 images all at once will slow down all of them, thereby slowing down your entire site. I have previously stated, that WordPress is a dynamic platform based on PHP. Every time a site is loaded, it accesses the database to retrieve information. So it is quite obvious that larger the size of the database, slower the site will load. Optimizing the database is a very important step if you need to ensure that your site loads up faster. You may have a very large site with thousands of posts and comments, but then also there are various unnecessary things in the database which can increase the size of your database several times. For example, each post in WordPress have several Post Revisions, which are simply never needed after you publish the post. Your site can also have thousands of comments in the spam section and hundreds of deleted posts and pages, which can also contribute to a huge database size. Another great way to speed up your site is to parallelize the loading of resources across various hostnames. Our browser can handle up to 60 HTTP requests simultaneously, but a single hostname can handle 2-4 requests only. But if we can distribute the loading of resources across various hostnames, then we can improve the entire loading time considerably. Even Google recommends the use of this technique to speed up you website. But using multiple connections at the same time can increase the CPU load considerably too. But it’s obviously a technique which is recommended for any page which serves more than 10 resources at the same time. And this plugin can do the job for you without any hassle at all. Another equally good alternative to this plugin is, WP Parallel Loading System. I have already mentioned before that too many plugins can actually slow down your website. Yes, it’s absolutely true. But organizing and ordering the plugins can solve this problem to some extent with efficiency. You can have many plugins installed, but you need to change the order in which they load up when a visitor opens your site. Important things come first, so the most essential plugins which needs to be loaded should have higher priority than the plugins which are not that important. That day is gone, when you had visitors only from Desktop computers. Now a days, we have visitors from different devices, some from mobiles, tablets and some from laptops and desktops. The screen sizes of different devices is different, and so having a single design is not acceptable anymore. Responsive design is gaining its pace in the web design world as studies claim that mobile usage will take over desktop usage by 2014. A great way to improve the site speed of your WordPress site, is to serve responsive images to your visitors which will adapt to various screen sizes with ease. It’s simply unnecessary to serve a high-quality image to a mobile or tablet user as we can reformat the image using CSS media queries and serve an image which is most appropriate for that particular screen size. This entry was posted in WordPress and tagged Page Load Speed, Speed up Wordpress, Wordpress Plugins, Wordpress Speed up Plugins on July 30, 2013 by Aritra Roy. Thank you for this incredibly useful article Aritra. What do you think about removing unused JS files WordPress adds to the footer and header, like when you don’t use Jquery for your pages as explained here: http://www.giftofspeed.com/speed-up-wordpress/ ? You think it would help? Thanks!